I have definitely been feeling SinfulColors polishes lately. First the SinfulShines, now this SinfulColors Leather Loose from the Leather Luxe collection. Leather Loose is an interesting brown/burgundy matte with gold shimmer flecks. I love matte polishes and I'm really glad they seem to be making a comeback this fall. The golden shimmer in Leather Loose is really pretty, especially outdoors and in brighter lighting. Indoors and in low light, it's a bit more hidden than these pictures show. This is three coats of Leather Loose. The formula was good, but probably not excellent. I had a little trouble because even though I kept wiping off the brush, but I would get a big lump of polish on the handle threatening to drop on to my nail. And if I wiped off the brush too much, it applied patchy. But after three coats, it looks pretty good and it was $1.99, so I'm still pleased. I am wearing this as a full mani, I just couldn't wait to wear it! I had to nub down last night, but this is a nice color for nubs so I'm not too sad. 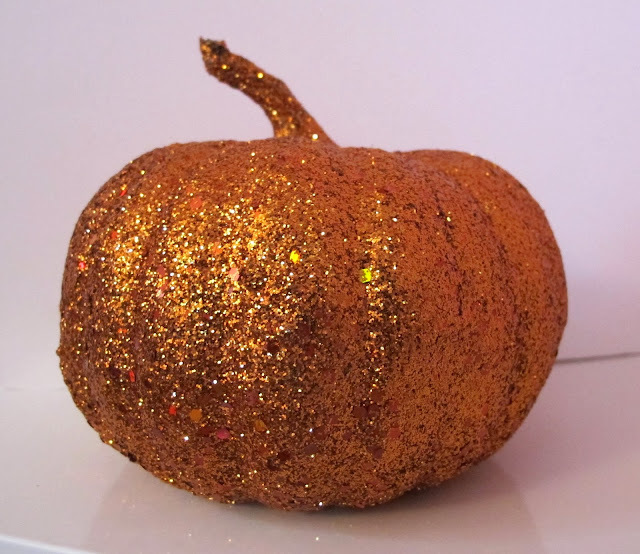 I also browsed the Halloween aisle while I was at Walgreens looking for Leather Loose, and found this adorable glittery pumpkin! I had to buy it, it's just too cute! SinfulColors Leather Loose is available now at Walgreens, but I believe it's limited edition, so get it while you can.